As smoke from a nearby wildfire pours into Yosemite Valley, Tom Lambert has had to tell tourists who booked his vacation home months in advance that they would have to defer their dream stays so firefighters could take protective measures against the growing blaze. The decision to shut the scenic heart of Yosemite National Park at the height of tourist season is heartbreaking for travelers, many of whom mapped out their trips months in advance to hike and climb amid the spectacular views of cascading waterfalls and sheer rock faces. "We had one guest who planned a weeklong trip," Lambert said. "It was a father-daughter trip, for her high school graduation ... Now it's done. It's sad." Another guest had to delay plans to climb Half Dome. Officials emphasized that Yosemite wasn't under imminent danger from the fire. Authorities decided on the shutdown to allow crews to perform protective measures such as burning away brush along roadways without having to deal with traffic in the park that welcomes 4 million visitors annually. On Wednesday, an extended family from Los Angeles on their annual trip to the national park prepared to leave the Upper Pines campground. Yosemite Valley will be closed until at least Sunday, along with a winding, mountainous, 20-mile stretch of California's State Route 41 that leads into the area, Gediman said. At least 1,000 campground and hotel bookings were canceled — to say nothing of the impact on day visitors, park workers and small businesses along the highway, Gediman said. Rangers went to campsites one at a time to inform visitors of the closures. Hotels guests got phone calls and notes on their doors. "This is the prime visitor season, so this wasn't an easy decision to make," Gediman said. "This was purely for safety's sake." The last time the 7.5-mile-long valley was closed because of fire was 1990, he said. Over nearly two weeks, flames have churned through 60 square miles of timber in steep terrain of the Sierra Nevada just west of the park. The fire was just 25 percent contained. 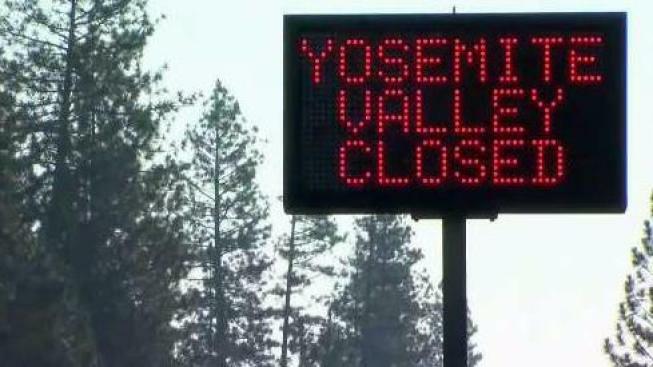 Rhonda Salisbury, CEO of Visit Yosemite/Madera County, said the regional visitors bureau has been relocating tourists statewide following the closure. "People are heartbroken," she said. "Some want to ride it out for a few days and see if they can get back in the park." Others want help finding places to stay away from Yosemite. "There are wonderful places to visit in the region, so we're asking people to consider alternative plans," he said. In Southern California's San Jacinto Mountains, a highway was closed and evacuations were ordered near the town of Idyllwild as crews tried to stop the spread of an out-of-control wildfire. In the state's far north, a 7-square-mile wildfire has forced the evacuation of French Gulch, a small Shasta County community that dates to the Gold Rush.